It’s been storming all over France this week and today was our department’s turn. Gard has had an ‘Orange Alert’ for thunderstorms all day today and Meteo France tells us to Soyez très vigilant; des phénomènes dangereux sont prévus. So we went for a ride in the mountains. There was a bit of humming and hawing at the parking lot in St. Jean du Gard before heading out, though, and in the end Erik sacrificed himself for my training (and his wife’s new bike break in) by deciding to drive support for us. This meant that, after asking him nicely to do so, he could take photos of us – a rarity on rides. Here’s a particularly nasty little ramp of 10%. Me, out of the saddle. Something I nearly never did when I was north of 75 kg. Oh, look, another 10% section. This road was a joy to ride. I think we met one car on it. Anne, on the way up to the Col du Mercou (Stephen, remember this one?). And her new Pinarello Dogma. The Mavic SLR black rims are actually aluminum, but have a decidedly carbon look. I think I’ve just found an upgrade for next year. The Mavic SLR has bladed spokes which reportedly work fine until you encounter a cross wind. You might want to see how Anne fairs with hers before adding them to your wish list. Am looking at Boyd wheel sets (if I ever get to that level where I “need” new wheels). Highly rated by its users and not expensive in comparison to Mavic’s. Good luck to you at the Haute Route lah. I’ve actually got bladed spokes, lah! I haven’t noticed anything in cross winds, but I can only imagine there’s something to it, since they show more to the wind. They’re actually not bladed, but round carbon fiber spokes. They seem a lot like bird bones – hollow and light. Thanks Gerry, I’ll take a look … I think Col du Mercou actually is in my future! Also, please tell Anne that her new bike’s somewhat older, and less fancy, cousin Pinarello sends greetings and highly approves of her choice. You don’t see many of them around here … so mine gets noticed. It’s a small climb, Suze, but you could certainly miss it if you’re on your way to St. Jean du Gard…depending on where you’re coming from I guess. Nice ride. 50km and 2100 climbing. Very nice. No wonder you missed the Orange weather. Judging by the pictures you were above the clouds. It’s probably half that, Luc, although I haven’t check Polar to verify. The Strava app on the phone is always adding elevation to my rides. Makes me look much better than the reality, I’m afraid. We headed the warnings here in Herault. Incorrect. Well done Anne on getting the new bike wet and grimy….. It was ‘moist’ up there, but manageable! 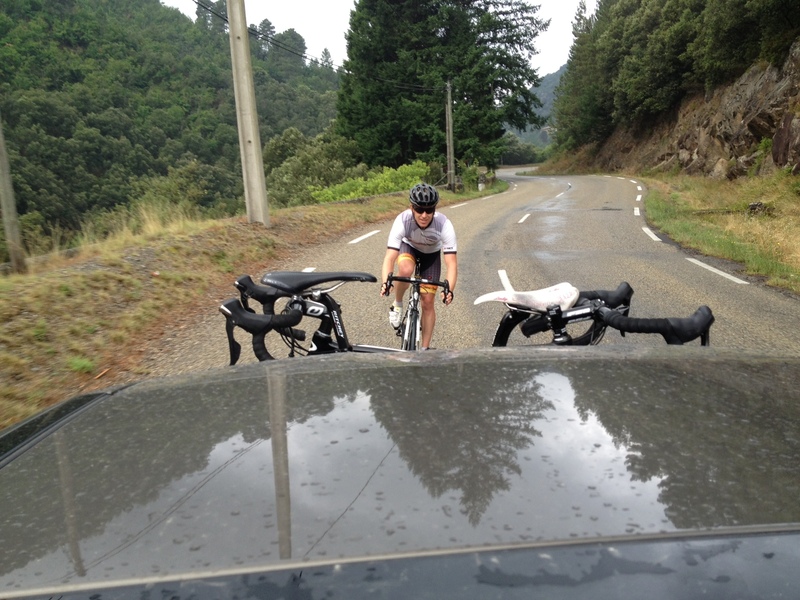 We had good luck on the roads yesterday, but even in the Cévennes things can happen. Anne and I have done races up there and had sections where half of the road was washed away because of heavy runoff coming down those steep slopes. 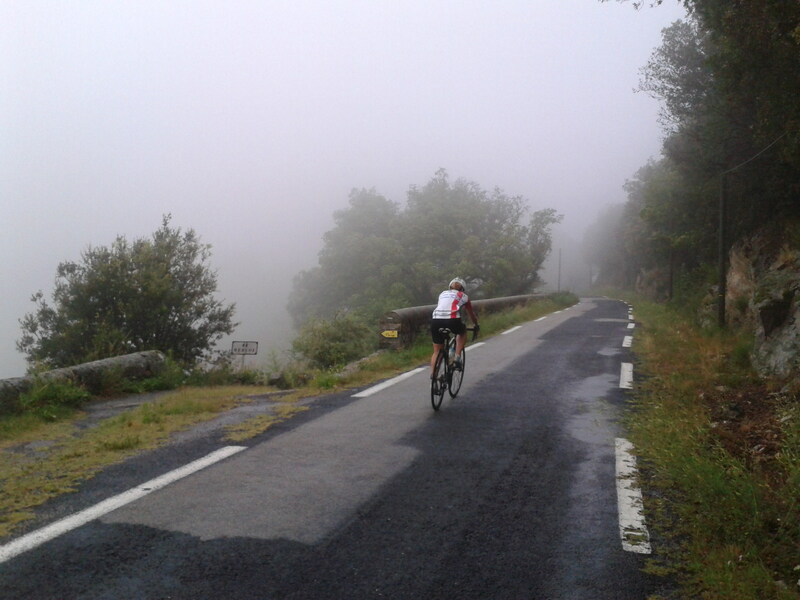 The Cévennes are one of my favourite places to ride, but you have to pay attention; once you get over some of those hills you’re a long ways from help and cell phones are rarely an option. The mountains are always to be respected, no question, Mr. Wet Blanket. Hehe, we had a bit more severe rain (I am under that tent) from the same system: http://www.youtube.com/watch?v=iJnPPXuneKQ Still, despite my company (a triathlete BTW… :D) wanted to quit, we finished the 170km (covered in dirt a millimetre thick)! But severe weather is no joke, while the lightning was near, we stayed put. You’re a harder man than me, Peter. All we had was drizzle yesterday.